"The political period we are now entering promises to require a redoubling of our efforts to organize against increasing oppression," reads the Black Lives Matter Healing Justice Toolkit, which offers tools for healing before, during, and after direct actions. "We will need to match this fortifying energy with elevated and innovative ways of caring and showing up for each other." Garcia said she thinks the shift toward "healing justice" — which recognizes the need for collective healing to create social change — comes from a growing acknowledgement of how systems can harm people, and allows for more discussions about health problems without being personalized. Carla Perez, cofounder of the Healing Clinic Collective, which provides free collective healing events for traumatized communities, said her previous work in environmental justice didn't allow for such discussions. "You couldn't talk about spirit as an organizer back then," she said while watering plants outside of her Oakland home. "There was faith-based organizing, but that aside, you couldn't really talk about any other spiritual aspect of your relationship to the issues that we were organizing around." The Healing Clinic Collective has helped others establish similar clinics and created a referral network of 130 healers and wellness practitioners, practicing more than 46 different healing modalities in the Bay Area. 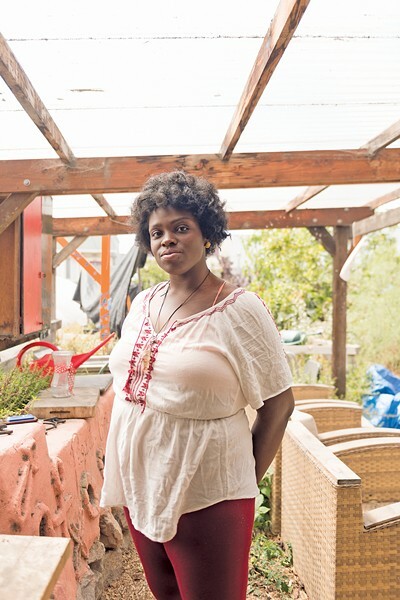 Atava Garcia Swiecicki, the owner of Ancestral Apothecary, an Oakland school dedicated to the study of herbal, folk, and indigenous medicine, is excited about the new wave of young women of color weaving together their organizing experience and socially minded values with natural medicine. "Let's dream big," she said. "If we say we want health care for all, let's include acupuncture, herbalists, and preventative medicine. It's not just about resisting the world we don't like, but it's about creating a world we do like." Daisy Ozim is the executive director of Resilient Wellness, a nonprofit in West Oakland that addresses multigenerational trauma in marginalized communities. Metzalli Van Dyne's face strained under her black-rimmed glasses to hold back tears. The "limpia," a practice of spiritual cleansing in Latin American traditional medicine, began with the sweeping of wet roses over the top of her head. Brenda Salgado, the curandera (the Spanish term for a folk medicine healer), made forceful and quick strokes, holding roses by the base of the stems and letting them snap as they brushed Van Dyne's upright body. "May the roses help to clear blockages that keep you from speaking your truth," said Salgado as she made a cross over Van Dyne's face, landing on her mouth. The most pain is carried in areas where the roses break, Salgado explained later. They always break over the heart, and in the pelvic area if someone has experienced sexual assault, she added. "The back is where we hold fear, feelings of scarcity," she said. She repeated other affirmations as she moved down Van Dyne's body, who was dressed in all black. A stream of white and peach petals landed on her combat boots as she released deep sobs. Van Dyne was one of the about 20 students in Ancestral Apothecary's two-month course called "The Curandera's Toolkit." The class primarily focuses on herbal medicine, while incorporating massage, meditation, and other aspects of curanderismo, all geared toward teaching students how to care for their own physical, emotional, and spiritual health. Salgado, a first-generation Nicaraguan born and raised in the Bay Area who received most of her training from Mexican indigenous healers, was the guest instructor that day. After demonstrating on Van Dyne, she taught students about the history of roses in medicinal traditions from around the world, how to honor the plants as they cut or buy them, and how to perform limpias on their classmates. Van Dyne said she didn't expect to have such an emotional reaction to the limpia, but that she was in a tumultuous emotional state and it brought back some feelings of deep heartache. Excited about deepening her knowledge around herbal medicine, Van Dyne said she took the class because she's experienced first-hand how "natural" or "folk" medicine has helped her health. She said in the last eight years she's used a balanced diet and herbal medicine to manage symptoms of polycystic ovary syndrome, instead of the pills originally prescribed by her doctor that gave her horrible side effects. Her condition is mild, but the hormonal disorder can cause fertility issues, which is what most concerned her. "I have had both physical and mental issues, where the Western modalities are helpful and they have brought some healing in the moment," she said. "But long-term, I find that I'm better off with more natural medicines." For Van Dyne, who was born in Mexico, the class offered a return to a healing tradition that she'd been estranged from since her childhood. Her great-aunt, who helped raise her, was a curandera. "She was always giving me teas and whacking me with plants and saying prayers, but I didn't really know what she was doing," she said. Her aunt lived with her in the U.S. until she had to return to Mexico, when Van Dyne was 8 years old. Van Dyne said that, as an adult, she got into healing and magic through paganism and other Eurocentric traditions. "But this class connected me to my own roots and the magic of my people," she said.